BIT 360 is the only screwdriver you’ll ever need because its rotating chamber holds and exchanges six common screwdriver bits, or ones you already own. 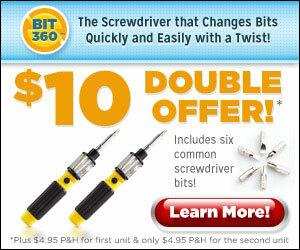 BIT 360 is simple to use, just remove the bit, twist to change the bit, and push to load a new bit. There is no more losing, dropping, or misplacing bits, keep them all in once place with BIT 360.